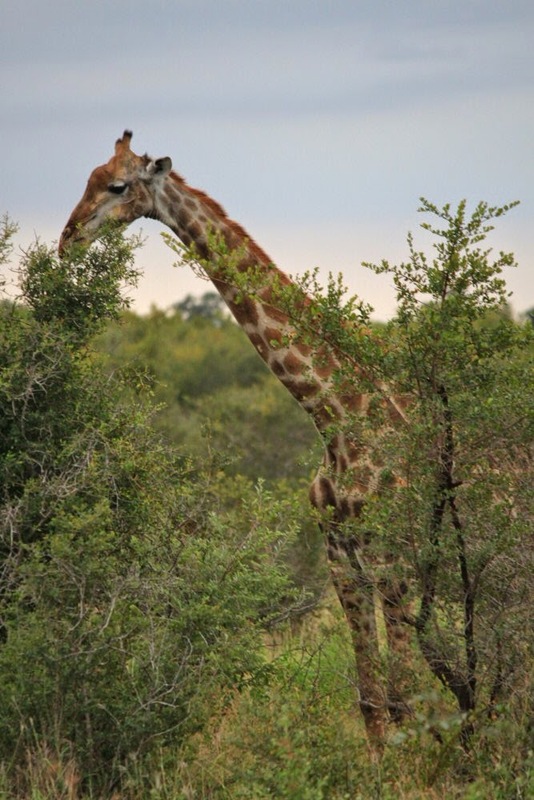 "" Writer's Wanderings: World Cruise - Safari One! 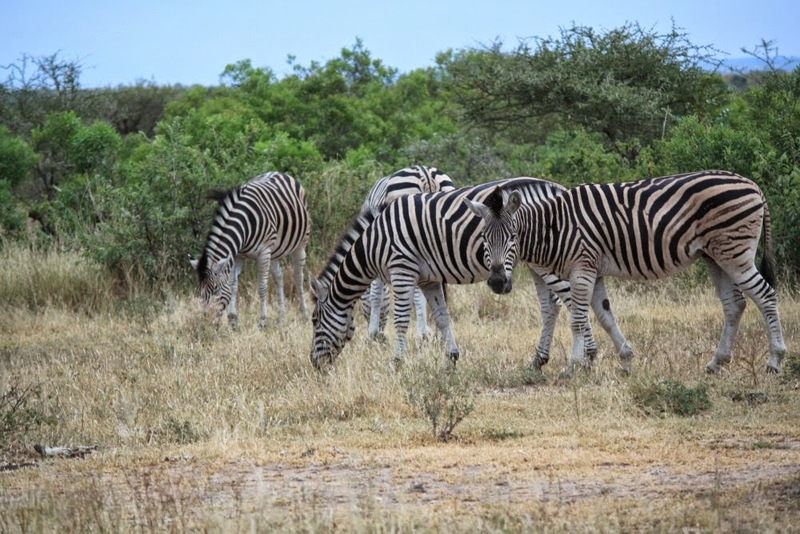 On the afternoon of our arrival at Lukimbi our first scheduled safari began at four. The day was not hot at all and once I saw the Land Rovers had covered tops I left my hat off. The cloudiness, we’d been told, might bring out more animals. Camera in one hand and tissues in the other (I was suffering from a nasty cold) I looked from one side of the Land Rover to the other, waiting and hoping. I really didn’t know what to expect. Thomas our tracker was positioned in his seat on the left front fender of the Land Rover and Craig, our guide, was driving. They spoke back and forth to each other in an African dialect and then Craig would tell us what they were discussing. Meanwhile, the radio crackled with voices that were reporting back and forth on what they were seeing in the wild. For a moment I thought I was on the Disney World Safari Ride in the Animal Kingdom. Disney surely got it right. Our safari never discovered poachers however. A little while into our safari and Thomas suddenly put an arm and a hand out toward the side of the road. Craig stopped quickly and there in the bush was an elephant. My heart quickened. I lifted the camera to my eye and started snapping. Soon we realized there was a little one following mommy. I was so excited. Little did I know it would only get better. 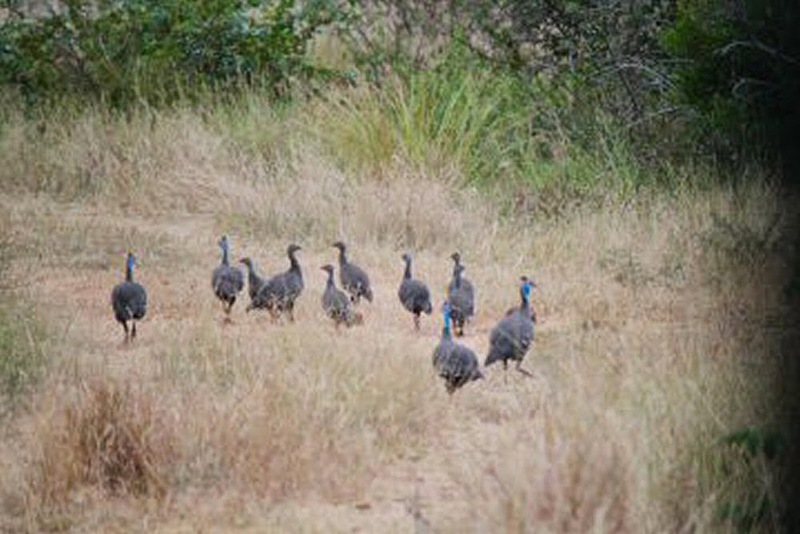 A flock of guinea hens created a stir as they rushed through the tall dry grass, across the road and into the grass on the other side. And then. . . a rhino! He seemed so close. It felt unreal, like perhaps we’d ventured into an enclosed safari park like back home. When we found some giraffes up close and personal I really felt like we’d been driving through Sandusky’s Safari Park. We’d taken our granddaughter several years ago and I remember her giggling when the giraffe poked it head and long tongue through the moon roof of Bob’s car to get at the food in her cup. We weren’t feeding these animals though but they certainly weren’t bothered by our presence. We sat in awe, snapping pictures and drinking in the beauty of magnificent creatures. On a more serious note, he explained that the stripes on a zebra are like a fingerprint. Each zebra is printed differently. More rhinos! And close up! 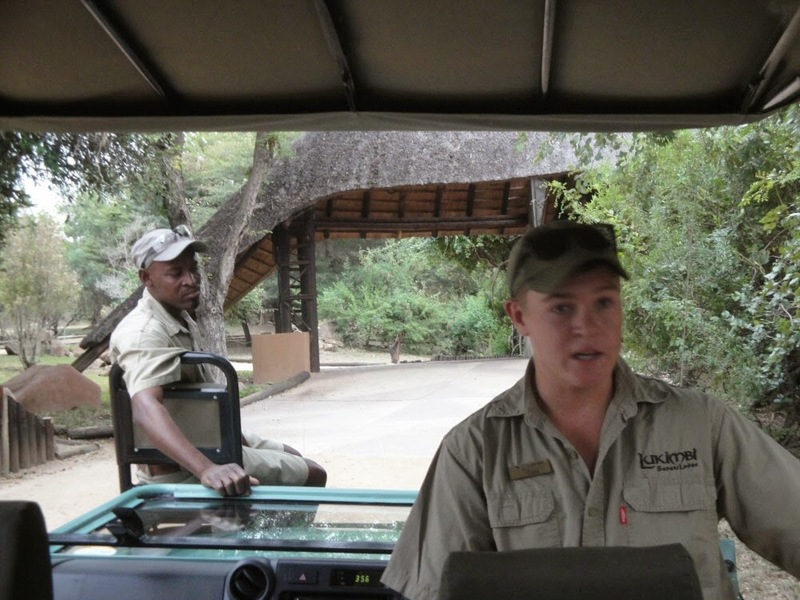 Craig explained the difference between white rhinos and black rhinos. Obviously they are both gray in color but there is a difference in the line of their mouth. I couldn’t really tell but guessed that most of what we saw were white rhinos since they are the more plentiful. 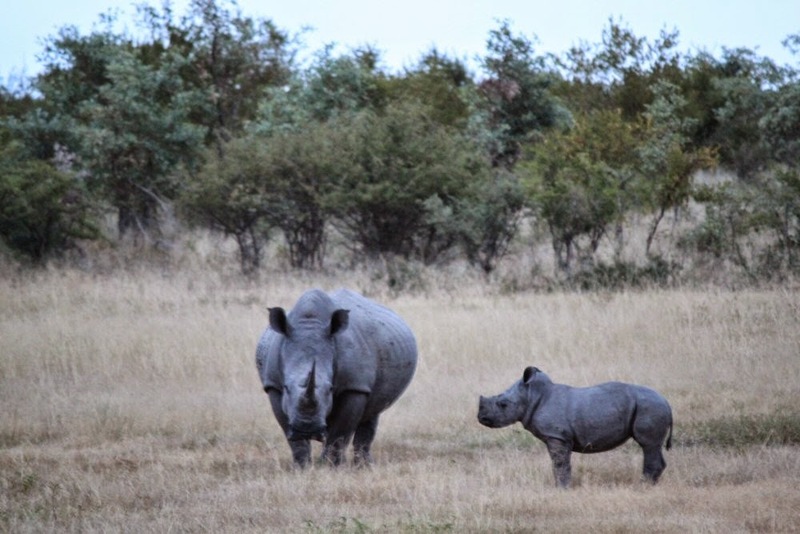 We were treated to a playful display of one mother rhino and baby. We marveled at the way such a heavy animal could move so lithely. It grew dark. We were supposed to have what they call a sundowner, a time to have a beverage and watch the sunset. There wouldn’t be much of a sunset this night since it was way too cloudy so we stayed on the road and continued to watch for more animals. Thomas was using a spotlight sweeping back and forth across the road along the sides to spot animals but he was having trouble with it. The bulb finally gave out and Craig used the headlights to illuminate our view. Suddenly Thomas held up his hand and we stopped. He pointed with a big grin. Leopard! Leopards are one of the big five that everyone wants to see when on safari. 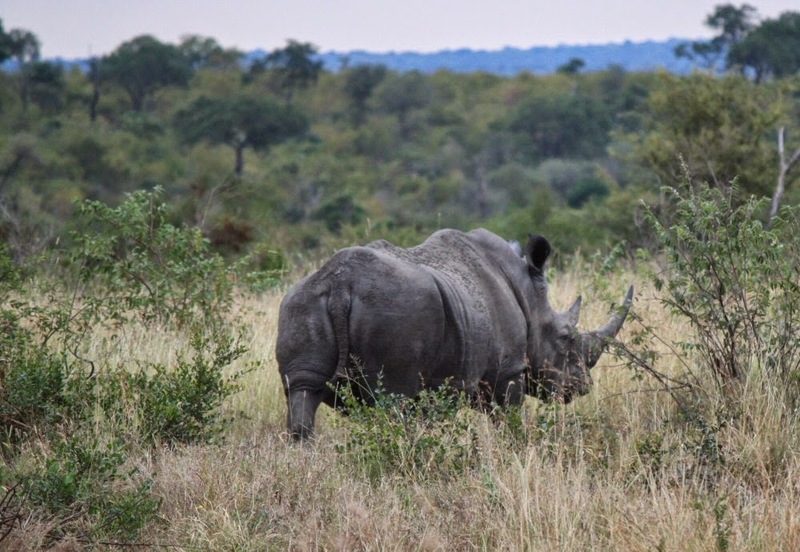 The big five include rhinos, lions, elephants, buffalo and leopards. Why? Because they are considered the most dangerous. However there is one animal that kills more humans than any other. But more on that later. It was next to impossible to get a good picture. 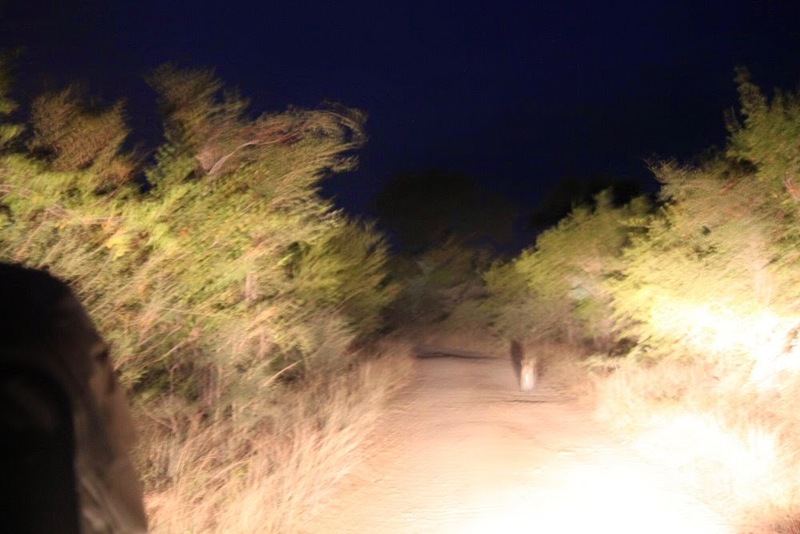 We kept having to move ahead to keep up with the leopard and even though it kept to the road for quite a while, the camera jostled too much as we moved for a good picture. It was one of those times when it would have to be more a picture in our memory bank rather than in a data file. It certainly topped off our first safari however. 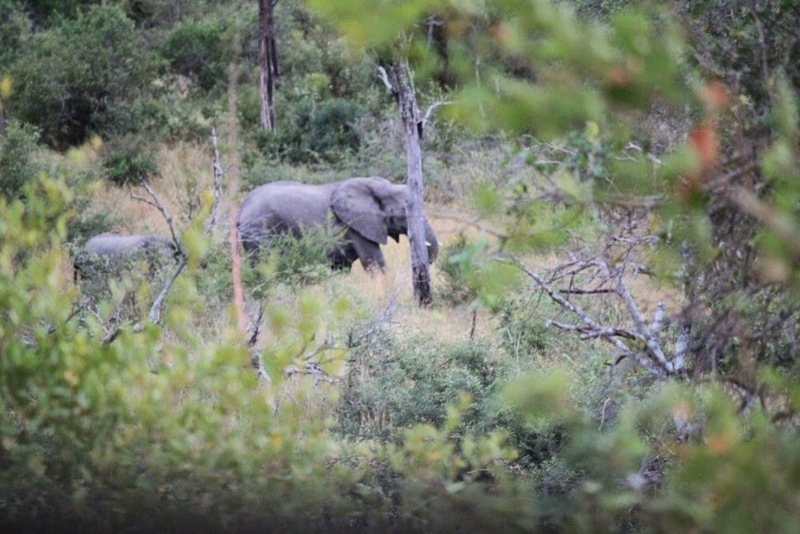 In less than three hours we had already seen three of the big five. I could barely breathe my head was so stuffy and I was exhausted but I was still going strong on adrenaline when we arrived back at the lodge. Craig walked us to our bungalows where we changed for dinner and then he gathered us up again for the walk to our dinner in an outdoor courtyard with tables surrounding an open fire. On the menu besides more beautiful fruits and vegetables was chicken and sausage and warthog! I took a piece of warthog thinking it would taste like pork—or chicken. It tasted like neither. Sort of like a mild beef that was maybe flavored with a little pork. It was good. The best part of the meal for me though was the hot pea soup. It couldn’t have been better for my cold had it been chicken soup. We left the group as soon as we’d finished eating. It was already nine and I was exhausted. 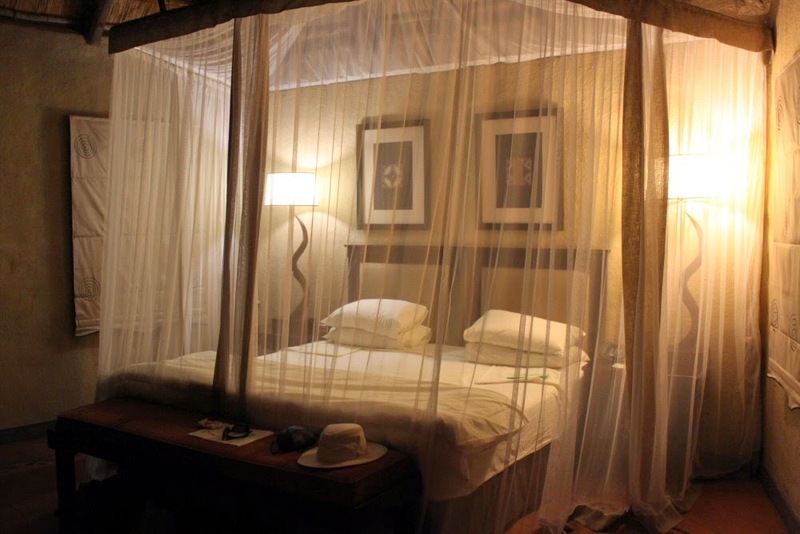 We returned to find our bed turned down and the mosquito net pulled around it. So inviting. The call for our morning safari would be early. Five-thirty. It didn’t take long to be sound asleep. Looks like an amazing adventure!